President Donald Trump listens to China's President Xi Jinping speak during their bilateral meeting at the G-20 Summit in Buenos Aires, Argentina, Dec. 1, 2018. Are trade wars “good, and easy to win,” as President Donald Trump put it last year? Most mainstream economists and foreign policy analysts answer with a resounding “no.” Citing dire analogies such as the Great Depression and Pearl Harbor, they denounce Trump’s trade policy as ignorant toward the principles of free-trade economics, and fraught with security risks. Both the United States and China will lose, critics warn. 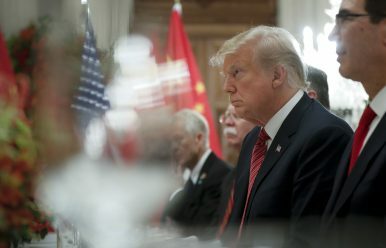 Yet a more thorough review of the historical record reveals a winning playbook for the White House, provided that it devises clear, limited aims it deems achievable through targeted measures and negotiations, and avoids presenting China’s leadership with a binary choice of absolute, humiliating surrender or forceful, even violent retaliation. The American Smoot-Hawley Tariff Act of 1930 has become the default worst-case analogy for macroeconomic analysts, much as the Munich Agreement has become for security analysts. A protectionist wave unleashed by the devastating 1929 U.S. stock market crash paved the way for Smoot-Hawley’s passage into American law. The resulting trade war reduced world trade by 66 percent between 1929 and 1934. Global economic conditions rapidly deteriorated, and the political fortunes of dangerous populist, nationalist, and even fascist leaders rose. Another distressing example of a trade war gone disastrously wrong comes from the cascade of events that led to the Pearl Harbor attack of 1941. To punish Japan for its military aggression against its neighbors in the 1930s, the United States imposed an embargo on exports of high-grade scrap iron and aviation fuel to Japan. When these measures failed to stop Japan’s aggression, Washington ratcheted up its embargo to include essential raw materials such as iron, brass, copper, and, fatefully, oil. Faced with a threatening military competitor and a collapsing Asian security order, these measures appeared to represent a relatively safe way to punish and deter Japan. But the August 1941 oil embargo proved to be the proverbial last straw. Eighty percent of Japan’s oil came from the United States; without understanding what it had done, the Franklin Roosevelt administration essentially forced Japan to choose between capitulation and conflict. Backed into a corner, Japan’s ambassador told Washington on December 2, 1941, “The Japanese people believe … that they are being placed under severe pressure by the United States to yield to the American position; and that it is preferable to fight rather than to yield to pressure.” Back in Tokyo, desperate Japanese leaders approved a plan to deliver a preemptive “knockout blow” at the American naval base at Pearl Harbor. A trade war thus brought America into World War II. However, the 1930s should not be policymakers’ only analogy. Trade wars do not necessarily result in hot wars, as the more recent history of trade conflicts suggest the possibility of other, even positive outcomes. In response, Nixon abruptly ended the U.S. dollar’s convertibility to gold, jeopardizing the entire postwar Bretton Woods global monetary system. Simultaneously, he instituted a 90-day freeze on wages and prices and placed a 10 percent surcharge on imports “to make certain that American products will not be at a disadvantage because of unfair exchange rates.” Like Trump, Nixon took these steps without informing U.S. allies and risked retaliatory measures, sparking a global outcry. Today, as the scholar Edward Alden argues, “The United States is less dominant economically than it was in 1971; U.S. allies are less prepared to accept the legitimacy of President Trump’s complaints; and the Trump team is far less competent and experienced than were Nixon’s advisers, who included Paul Volcker, Pete Peterson, Robert Hormats and Henry Kissinger.” Not to mention the fact that Nixon’s abandonment of gold convertibility most likely played a role in causing the soaring inflation of the later 1970s. Yet in both episodes the president was obsessed with righting America’s trade balance, and Trump’s trade actions today could yield results not wholly dissimilar from those produced in 1971. Back then, with the U.S. dollar as the world’s reserve currency, foreign parties chose not to risk long-term escalation, instead opting to negotiate with the Nixon administration. This soon led to the December 1971 Smithsonian Agreement, which shifted exchange rates in America’s favor. While today’s exchange rates are not fixed and thus cannot be as easily adjusted, other concessions on trade could be garnered to boost U.S. exports. The Smithsonian Agreement failed to remedy all of Nixon’s grievances, and indeed the entire Bretton Woods system collapsed soon afterwards. But no less a thinker than the future legendary Federal Reserve Chairman Paul Volcker — who was undersecretary of the treasury for monetary affairs under Nixon — supported the rash step, telling an interviewer in 2000 that Nixon’s ending of the Bretton Woods system was “a necessary transitional step.” And the strategy proved popular at home. Just over a decade later, concerns over Japanese monetary and industrial policy and a ballooning trade deficit prompted the Ronald Reagan administration to take concrete actions targeting Japan, using section 301 of the U.S. Trade Act of 1974 to place tariffs on Japanese imports — the same measure used against China today. And as with the Trump administration regarding the Chinese telecommunications company ZTE last year, the United States cited national security concerns with Toshiba. In defiance of U.S. sanctions, ZTE sold military grade equipment to Iran and North Korea; Toshiba had violated previous agreements with the United States by selling technology to the Soviet Union that was useful for its production of advanced submarines. Japan caved to the pressure, as U.S. negotiators secured the multilateral Plaza Accord of 1985, which devalued the dollar against the yen and rendered U.S. exports to Japan dramatically more competitive. The U.S. Congress then went further in 1987, imposing import restrictions on Japanese electronics, including Toshiba products. In response, Tokyo agreed to measures designed to reduce Japanese exports of steel and cars to the U.S. market, increase U.S. imports to Japan, and eliminate barriers to entry for American companies in Japan. What Trump can learn from his fellow Republican predecessors is that White House-initiated trade wars do not automatically end in disaster. Aggressive trade measures can compel opposing parties to provide real concessions, and even put the global economic system on more sustainable footing. The Plaza Accord coincided with the negotiations that led to the creation of the World Trade Organization, a major win for an open and rules-based global economic order. It is thus not out of the question that Trump’s tariffs on Chinese imports could result in substantive “wins” for the U.S. economy in the form of increased Chinese purchases of American exports, the ban of forced technology transfers, and stronger Chinese intellectual property laws. Nixon and Reagan’s experiences illustrate this possibility, yet also demonstrate the limited nature of trade wars’ upside. In neither case did the United States receive everything it wanted. Even aggressive action could not completely alter supposedly unfair economic relationships that U.S. policymakers sought to redefine, as trade deficits persisted. The Trump administration can learn from the recent history of trade conflict by acknowledging that bold, unilateral action does not present some novel threat to the rules-based order. It has plenty of precedent in an arena where countries seek to both ensure mutual benefit and secure individual advantage. At the same time, Trump is unlikely to get the easy victory he seeks. At best, he will arrive at a marginally improved outcome determined not by bluster, but by strategic, serious negotiations. Yet U.S.-China trade cannot easily be isolated from the growing national security concerns that a broad and bipartisan group in Washington has set forth regarding China. Economics does not receive an exemption from the threatening dynamics of geopolitical competition. Finally, Trump and his advisers should understand the need to devise clear, limited aims that they deem achievable through targeted measures and negotiations. They should identify and choose policies sharp enough to produce concessions, but restrained enough to avoid presenting the Chinese leadership with a binary choice of face-losing surrender or vicious retaliation. If the Trump administration instead goes after a symbolic, total victory, America may find itself forced to accept an embarrassing defeat. Arjun Kapur is a Schwarzman Scholar at Tsinghua University in Beijing, China. Pushback: America’s New China StrategyWhy the US Trade War on China Is Doomed to FailUS-China: A New Consensus for Strategic Competition in WashingtonEast Asia Comes to EuropeWill Trump Cement the China-Russia Alliance?